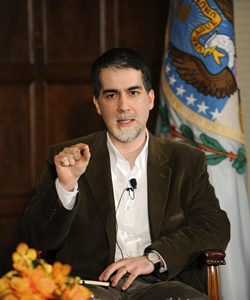 Caner Dagli is an associate professor in religious studies at the College of the Holy Cross, specializing in Qur'anic studies, interfaith dialogue, and philosophy. He previously taught at Roanoke College in Virginia. Born in the United States, Dagli is of Ciracassian descent and has done fieldwork in Turkey. He also spent a year working as special advisor for interfaith affairs to the Royal Hashemite Court of Jordan from 2006 to 2007. Among his works are the HarperCollins Study Quran (2015, edited with Seyyed Hossein Nasr, Maria Massi Dakake, Joseph E.B. Lumbard, and Mohammed Rustom) and The Ringstone of Wisdom (2004). Dagli holds a M.A. from George Washington University's Department of Religion and a Ph.D. from Princeton University's Department of Near Eastern Studies and was a 2004-2005 Fulbright scholar. Dagli was one of the 138 Muslim signatories in October 2007 of A Common Word Between Us and You.